Keen to explore the back streets and mews with their well-known residents and historic pubs? How about trying the famous cheese that launched La Fromagerie Cheese Shop? Want to explore some of London’s best food shops? …Then join us for ‘Walking Marylebone’. -Take a relaxed guided stroll through the back streets of Marylebone, starting near Baker Street tube and finishing between Oxford Circus/Regent’s Park and Great Portland Street tubes. 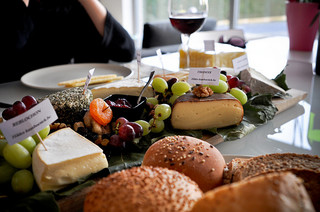 -Sample La Formorgerie Cheese Shop’s famous cheese! -Learn where to go for a sing song around the piano! -Discover some of the best food shops around, including quite possibly the best fish and chips shop in London! -Visit 2 historically fascinating pubs, spending 30 minutes at each. -Professionally guided tour and informative commentary by a qualified City of Westminster guide. -A small taste of cheese presented by La Fromagerie. -Maps and links to places mentioned on the tour. -An invitation to join our guest at an exclusive after walk party on the 15th Floor of the St Georges Hotel. We want you to hear the guide throughout your experience; therefore, the number of people on this walk is limited to 15 attendees. The meeting point will be sent with your payment confirmation. So, why not JOINas a Bon Vivant Member and receive exclusive invites and special discounts? This entry was posted in Events, Walk and tagged Historic pub, Marylebone on 6 April, 2012 by adminfw.